Definition at line 550 of file compose.h. Definition at line 553 of file compose.h. Definition at line 560 of file compose.h. Definition at line 558 of file compose.h. Definition at line 554 of file compose.h. Definition at line 557 of file compose.h. Definition at line 555 of file compose.h. Definition at line 567 of file compose.h. Definition at line 575 of file compose.h. Definition at line 585 of file compose.h. Definition at line 592 of file compose.h. Definition at line 615 of file compose.h. 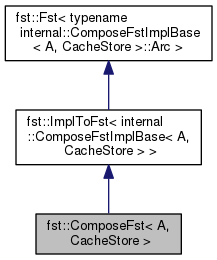 Implements fst::Fst< typename internal::ComposeFstImplBase< A, CacheStore >::Arc >. Definition at line 597 of file compose.h. Definition at line 651 of file compose.h. Definition at line 641 of file compose.h. Definition at line 619 of file compose.h. Definition at line 603 of file compose.h. Reimplemented from fst::Fst< typename internal::ComposeFstImplBase< A, CacheStore >::Arc >. Definition at line 607 of file compose.h. Definition at line 703 of file compose.h. Definition at line 562 of file compose.h. Definition at line 564 of file compose.h. Definition at line 563 of file compose.h.